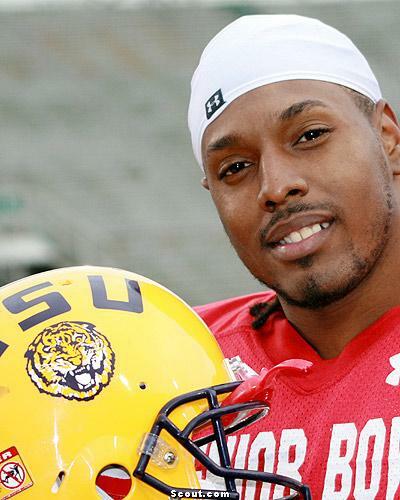 The Kansas City Chiefs drafted LSU wide receiver Dwayne Bowe with their first pick in the 2007 NFL Draft. Player Evaluation: Productive throughout college, Bowe has the physical makeup and dimensions to be a number two receiver at the next level. Has his game on an upswing and offers starting potential as a rookie. Biography: Three-year starter awarded All-Conference honors as a senior after totaling career-best numbers of 65/990/12. Led the team in receiving as a junior, producing 41/710/9, after 39/597/5 as a sophomore. Pos: Big, possession wide out who significantly improved his consistency as a senior. Sells routes, settles into the open spot of the defense and always works to become an available target. Uses his frame to shield away opponents and protect the pass. Lays out for the difficult reception or gets vertical to pull the ball from the air. Displays good eye/hand coordination, effectively uses the sidelines and makes the reception in stride. Solid downfield blocker. Neg: Lacks the deep speed and cannot stretch the defense. Occasionally drops a catchable throw. Wonders never cease. It seems like Kansas City’s top need the past five seasons has been receiver and they haven’t taken one since they drafted Sylvester Morris in 2000. The hope is Bowe pans out and there’s reason to be optimistic. He has outstanding size, he catches the ball well and he makes fluid cuts so he clearly has the potential to develop into a reliable possession receiver. Though he doesn’t have elite speed and he isn’t going to run by defensive backs, he is big and fast enough to make the occasional play downfield so he can stretch defenses vertically. With the Larry Johnson expected back and Bowe taking advantage of TE Tony Gonzalez keeping the safeties occupied, this offense should be even more productive than is was last year despite the likely departure of Trent Green.